(CBS/AP) Pre-sliced apples distributed to fast-food and grocery chains across the country are among packaged products being recalled due to possible contamination with Listeria bacteria. Missa Bay LLC, owned by Ready Pac Foods Inc. of Swedesboro, N.J., announced the voluntary recall on Friday, saying a total of 293,488 cases and 296,224 individual units went to 36 states and the District of Columbia. People who may have purchased the recalled products are asked to record use-by dates and UPC codes and contact Ready Pac at 800-800-7822. More information on the more than two dozen products recalled and the states involved is available on the company's website. A complete list of products can also be found here on the Food and Drug Administration website. Packaged apple slices distributed to McDonald's and Burger King in some states are included in the recall, as are some packaged fruit, veggies, salads and sandwiches containing apples distributed to Wawa convenience store and Wegman's grocery chains. Various apple and fruit snacks with "Ready Pac" labels and apple salad kits with a "Safeway Farms" label are included as well. Specifically, 1.2-oz. packages of apple slices with "McDonald's" label that were sold only in Connecticut, Massachusetts, Maine, New Hampshire, New Jersey, New York, Pennsylvania, Rhode Island and Vermont on or before Aug. 19 were included in the recall, including oatmeal products containing apples sold in those states. Also included were McDonald's 5.75-oz. fruit and walnut snacks sold on or before Aug. 20. Burger King's 2-oz. fresh apple slices sold on or before Aug. 30 are included in the recall. No illnesses have been reported, but the recall was a result of Listeria being found on equipment used to produce apple products by Missa Bay. The recalled snacks have use-by dates of July 8 through Aug. 20, the company said. People should check their refrigerators for products with those use-by dates, the company said. It asked retailers to check store shelves and inventories to make sure none of the packages are there. 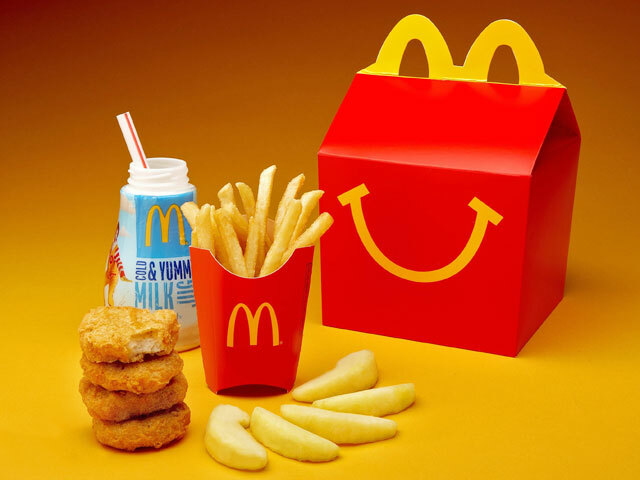 Last summer, McDonald's announced healthier Happy Mealswould include fruit automatically with every meal purchased. Previously kids had been offered a choice between fries and apple slices with caramel dipping sauce. Burger King also announced last summer its cashiers would routinely ask customers if they wanted "healthier apple fries" instead of the standard for French fries. Listeria is a bacteria that causes food poisoning and is especially dangerous to the elderly, people with weakened immune systems and pregnant women. While a pregnant woman may experience mild, flu-like symptoms, the illness caused by Listeria -- called listeriosis -- can lead to miscarriage, premature delivery or life-threatening infection in newborns. Earlier this month, seven tons of pre-made meat and pasta salads from Garden Fresh Foods were recalled over concerns onions in the products may have been contaminated with Listeria. An outbreak ofListeria in cantaloupes last year was linked to 30 deaths and one report of a pregnant woman who had a miscarriage while she was sick. In total, 146 people were sickened across 28 states.